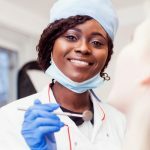 Tooth Extraction vs. Root Canal Treatment? After root canal treatment, you’ll start noticing the benefits. If you’re suffering a serious tooth infection, there are two common ways to alleviate the pain: tooth extraction vs root canal treatment. 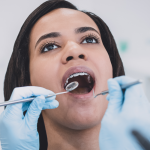 Many patients see tooth extraction as the more simple and affordable choice of the two, but that’s not always the case. If you’re seeking alternatives to tooth extraction, then consider root canal treatment. Root canal treatment holds several advantages over tooth extraction, cost being one them. While the upfront costs of root canal therapy are higher, tooth extractions often lead to long-term costs. When you get a tooth extraction, you’ll typically be required to get a dental bridge or implant to hold the place of the missing tooth. Some people consider a tooth replacement as unnecessary, but that depends on your specific case. Aside from aesthetics, a gap in your teeth creates an imbalance in the structure of your mouth that can become impossible to correct. That is because the stomatognathic system (comprised of your facial muscles, teeth, nerves, etc) compensates naturally for the missing tooth, with other teeth gradually moving to take its place over time. A replacement tooth or bridge is essential to maintain your mouth’s long-term functionality. While the upfront costs of root canal therapy are initially more expensive, the additional procedural costs associated with extraction can accumulate quickly. The good news is that because Penn Dental Medicine’s association with the University of Pennsylvania’s School of Dental Medicine, you have the benefit of receiving exceptional care at a discounted rate. Root canal is a more convenient and healthy choice. Root canal therapy is virtually painless due to modern techniques and anesthesia. According to the American Association of Endodontists, patients who choose root canal treatment are six times more likely to describe it as painless as compared to patients who opt for tooth extraction! In root canal therapy, an endodontist removes the inflamed or infected pulp inside the tooth, cleans out the root canal, and fills and seals it. Finally, the tooth is restored with a crown or filling, after which it will look and function as a perfectly normal tooth! Compared to tooth extraction, which generally causes more pain and involves more follow-up visits, root canal therapy is easy and time-saving. Endodontic treatment has a high rate of success, with results that last a lifetime. 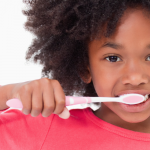 With minimum time and discomfort, your tooth can be saved. And no bridge, denture, or even implant will feel exactly like your natural tooth. Is Root Canal Therapy Worth It? The resounding answer to this question is YES. Root canal therapy involves lower overall cost, less discomfort, and less time spent in the dentist’s chair. Though tooth extraction may look like an attractive option initially, it’s clear that root canal treatment is the ideal treatment option. Anyone who is considering tooth extraction vs root canal treatment should consider their treatment options accordingly. After root canal treatment, the tooth and the area around it may feel sensitive for a few days. If the infection spreads, your dentist may prescribe antibiotics. At your follow-up visit, your endodontist will remove the temporary filling and replace it with a crown or permanent filling to protect the tooth from future damage. If for some reason the tooth continues to hurt or the pain returns, tell your dentist. A retreatment procedure is an effective solution to save the tooth if it contracts infection again. 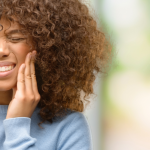 If you’ve been experiencing toothache, and especially if those toothaches have progressed to a generalized headache, then you need to talk to an endodontist. 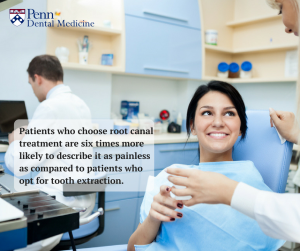 Please call our office at 215-898-8965 to schedule your root canal evaluation.